This quilt reminds me of my baby going up and down the stairs 1500 times a day. Chasing him up and down is the only exercise I get lately so I guess it’s a good thing! The back of this one is the big Make Life dot by Sweetwater (bought here) and I quilted this following the lines of the “steps” with an extra line on the top edges of each step for an extra something. It’s machine bound in Kona Aqua. I love this! ANd I love the quilting. Very sweet. very cute – great colors and a fresh take! 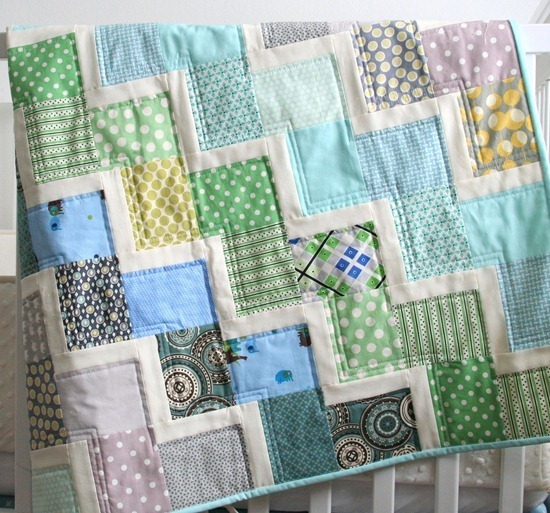 I love this quilt – it is so cute! I think I said the same when you showed a previous pic of the top, but just SOOOOO cute! Love the pattern and colors! Super cute! Can't wait to see how you did it. This has to be one of my favorites~thank you for taking the time to make a tutorial. Super cute! I will be watching for the pattern! Thanks for sharing…you do such nice work. I love the pattern. Using less white looks so much nicer than a full zig zag of white. The colors are great too! Thanks! So cute! I remember those days of babies on the stairs. Sigh… enjoy them while they last! Lovely. The quilting is awesome! So nice!!!!!!!! Wonderfull quilt and wonderfull fabric. Wow, that is great. 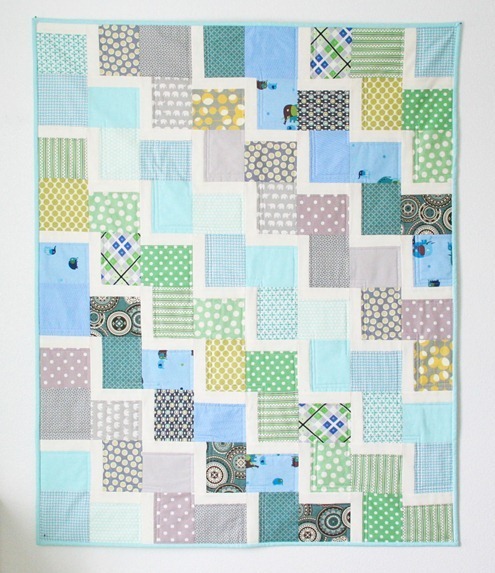 So bold to use a dotted back with all that straight-line quilting. And it looks marvelous. I love the quilt! It looks amazing. It looks great. I love the soft colors you choose for it. It looks like it came together fast? oh this looks so great…i can not wait to see the tutorial. Ohh Alison this quilt is spectacular love the colours. What a darling quilt! The colors are great and I like how you quilted it. Looks like it would take care of some of my scraps and stash! So cute. Can't wait to see the tutorial. I love your quilt. It does remind you of climbing stairs when you look at it. this is adorable! i love it – great job! Okay. You're going to have to seriously stop quilting. I'm about to pull out my debit card everytime you post a new one. I keep saying "this one's my new favorite"!!! I LOVE this one! Great job, as always!! 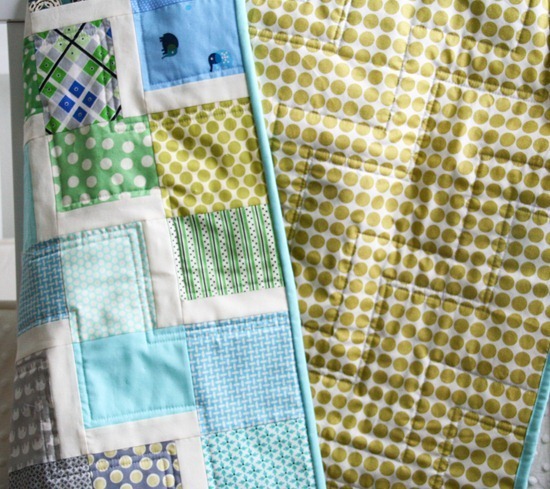 I am so jealous that you get to make quilts to sell on Etsy. I am still trying to find time to make one for our house! What a gorgeous quilt, love the colours. So much work! Oh my this is just beautiful!! Have you got space in your quilt cupboard :-) ?? Lovely quilt! Both color combination and pattern are fantastic. Very nice. Can't wait to get the instructions. The quilting really does it for that quilt! Maybe you can write a post about how you fit in the time and some of your tricks to making progress when you're running around after little ones! do you leave your sewing machine and ready at all times? Beautiful! Wonderful colours and a fun take on a zig-zag design. Ooooo. I love this one! I've been drooling over your stash zigzag pattern too and am loving the staggered steps here. Woot woot! Like everyone else, I really like this quilt! A tutorial would be great. This is adorable! And you did such a nice job choosing fabrics! What a sweet quilt. Love your color choice. Can't wait to see the pattern. I love this quilt. The colors are just "baby" enough if that makes sense. Just beautiful. I'm just now finding this. This is a wonderful pattern for using up all the colorful scraps I have! Thanks!